Photos Gordon Laing is the editor of CameraLabs.com, where an extended version of this story originally appeared. The launch of Space Shuttle Atlantis on its final mission was an awesome sight. I’ve seen many launches on TV – most with a tear in my eye – but this was my first in person, and it didn’t disappoint. Indeed, it was quite surprising in a number of ways. Launch day for me started early. Very early. With approximately one million people expected to flood the surrounding areas, everyone was warned to get to their viewing locations in plenty of time. I’d managed to bag a ticket for the NASA Causeway – the closest public viewing location from a distance of about six miles – from an operator called Florida Dolphin Tours, and they wanted us to board our buses by 2:30am and ideally meet about an hour before. That meant leaving my hotel shortly after midnight. It’s always a tough call deciding what to do about sleep when you have somewhere to be after midnight, but jetlag from my arrival in the US just two days earlier meant I simply wasn’t sufficiently tired in the evening even for a nap. So I decided to stay up and fight through. The drive to the meeting point in Festival Bay Mall in Orlando itself went very smoothly, but the final few hundred meters to the carpark were gridlocked. I’d actually arrived at one corner of the mall car park at about 1:30am, but didn’t make it out of my car until close to 3am. Luckily, I was far from being the last to arrive, so there were still plenty of buses waiting for us. I was assigned bus 37, and we arrived at Kennedy Space Centre (KSC) around 5:30am. NASA security at Kennedy Space Center is not unlike that of an airport with metal detectors and bag searches, and they do not allow you to leave anything on the bus. Bags with wheels are also not allowed, so that means having to carry everything until you can re-board the bus. That time was set for around 6:30am, giving me about an hour to lug my 30kg camera bag, two tripods and foldup chair around an eerily dark KSC in a zombie-like dream-deprived state, while their constant soundtrack of stirring space music played incessantly from every speaker. Actually, 90 minutes isn’t bad, as previous launches could have you wandering KSC for hours, which wouldn’t be such a bad thing if you weren’t so laden-down with equipment. I know what you’re thinking: just sit down at one of the cafes or even recline in the Imax while you wait, but re-boarding your assigned bus is neither a quick nor trivial exercise. At some point, you and several thousand others have to join and work through the world’s longest queue, which snakes its way around KSC, cruelly double-backing several times as you think you’re approaching the end. The queue moves excruciatingly slowly at times, but never stops long enough for you to put your bag down. So I lugged all my gear for about another hour and a half before finally getting to sit on the bus at 7am. 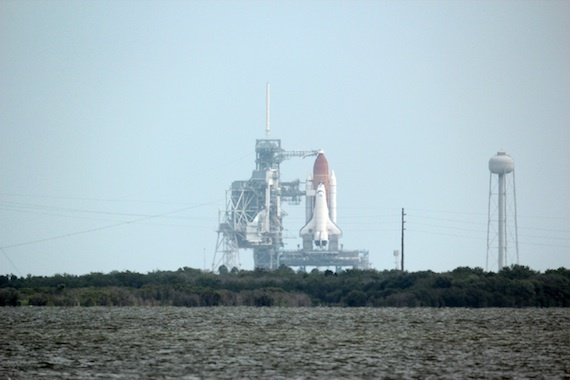 Mercifully, the tropical downpours from the day before kept away, although NASA was still quoting only 30 per cent chance of launch due to bad weather. Then the bus just sat there, as all the others filed up and gradually drove off. My hopes of getting pole-position on the Causeway were looked increasingly slim as bus after bus departed while mine remained resolutely in the carpark. Dishearteningly, mine ended up being the third from last bus to leave, finally crawling out of the parking lot about an hour and a half after I boarded it. All I could think about on the way to the Causeway was how it would be packed by now with no clear views remaining – at least of the Shuttle on the pad anyway. Half an hour later we arrived at the Causeway and my fears were realised as we drove slowly past crowds of thousands who’d already bagged what looked like the best spots and setup their gear. Indeed, the entire front row was occupied, leaving me with the nightmare scenario of either not having a clear view of the Shuttle, or thinking you’ve got one through the crowds, only to have the view blocked at the critical moment as the person in front of you leaps up and cheers. It was not looking good, but I remembered the start of the Causeway looking a little quieter than the end we parked-up in, so I gradually lugged my bag, tripod, and chair in that direction. It was now two and a half hours before launch, and the rain continued to stay away. Striding along the Causeway, I quickly realised there was no way I’d get to squeeze into any gap on the front row, so I opted for the opposite strategy by setting-up at the back, just by the parked vehicles. The Causeway itself is on sloping land, which steepens a little towards the back, so somewhat like a cinema, those at the rear have a slightly elevated position which might just clear those in front. I found what looked like a good spot with a clear view of Atlantis on the pad and began working out who if anyone would block my view in front. My heart sank when what looked like the world’s tallest man stood up three rows in front, but thankfully, the slope of the Causeway allowed my cameras to see over him. The only potential problem would be the row immediately in front, but it turned out they belonged to a very nice family who were also setting up equipment alongside me, and they agreed they’d keep the seats directly in front of our cameras unoccupied. They really saved the day for me. In fact, all the people around me were wonderful. It was a bit like being at the first night of a big movie at a major cinema, where everyone in there was really into the show – only there were at least ten times more people on the Causeway, and the event was never to be repeated. You can imagine the excitement and anticipation. I had such a great time meeting the folk around me, hearing their stories and comparing equipment; NASA had also sprinkled-in a number of special guests and it was only after a few minutes I realised one of the guys I was chatting to had worked on the team which built the Shuttle’s main engines! In fact, I was having so much fun chatting to the people around me that the first time I checked the time, there was only half an hour to go before launch and I hadn’t even setup my cameras properly, let alone taken any photos. So I mounted my Canon EOS 7D and EF 500mm f4L lens onto my Wimberley Gimbal head and Manfrotto 055CXPRO3 tripod, and my EOS T3i/600D with EF 70-300mm f4-5.6L lens onto my Gitzo GT2180 head and 1541T legs. The tripods were mine, but all bodies and lenses were rented from BorrowLenses.com. I had been a little concerned the compact Gitzo legs and head wouldn’t support its front-heavy load stably, but it was actually remarkably good. That travel tripod continues to impress me. Greedily, I wanted a third camera for wide-angle video, so mounted the Panasonic HDC-HS900 camcorder onto the EOS 7D’s hotshoe via a small adapter I’d bought in San Francisco, and hoped the 7D’s shutter mechanism wouldn’t shake the footage too much. The 3D lens adapter could have been neat here, but I was seriously running out of time and opted to film in good old two dimensions. The great thing about being at the back of the Causeway was being able to capture both the Shuttle’s launch and the crowd reaction in one view. I’d have loved to deploy my other backup cameras too, but I had run out of things to mount them on, not to mention time to set them up. I shot a few test exposures and video and had great fun trying out the T3i/600D’s movie crop and digital zoom facility with some big lenses. This mode crops a Full HD 1920x1080 frame from the middle of the sensor, thereby effectively magnifying the image by a further 2.5 times beyond the initial sensor crop itself. The great thing is: it’s still recording Full HD video with no compromise in quality. My plan had been to implement this on the 70-300mm lens for closeup video, but it would have meant losing the Shuttle only seconds after take-off, so I decided to film normally with this setup. But in the moments prior to launch I decided to have some fun. A nice guy to my right had rented a Canon EF 800mm f5.6L for use with a 5D Mark II, so I asked if he wanted to see how the video would look. We mounted one of my T3i/600D bodies and started by filming video without the crop mode applied. You can see a still frame of this below, where the combination of an 800mm lens on a cropped-frame body has resulted in an effective focal length of 1280mm. Ok, now for a video of Atlantis with the T3i/600D and 800mm, but with the digital zoom applied. As mentioned above, this doesn’t apply any scaling at its minimum setting, only a clean 1080p crop, applying an extra 2.5x magnification without any loss in quality. So the video you see below was filmed at an effective foal length of 3200mm - so you’ll forgive a little wobbling due to the strong cross-winds! It would have been fun to film the liftoff at this sort of power, but again the Shuttle would have been completely obscured by smoke and steam. But it was a fun proof of concept, and as you saw earlier, I also exploited it to grab some neat footage from the viewing gantry the day before at a distance of one mile. If you’re into high-power video, this makes the EOS T3i/600D one of the best options out there (although to be fair, the Panasonic GH2 also offers a similar movie crop mode). I was having so much fun with this high power video that, with only three minutes to go, I realised my EOS 7D and 500mm were still in a landscape orientation, whereas I wanted portrait for launch. I also noticed my T3i/600D for all the lens swapping fun now had a huge dust mark right in the middle of its frame. So with less than 200 seconds remaining, I actually changed my entire setup, turning and recomposing the 7D into a portrait orientation, and swapping the dusty T3i / 600D for my backup body. With the 7D’s hotshoe now pointing to the side, the camcorder was also now 90 degrees off, so I also had to quickly re-adjust its mounting. Then with about 30 seconds to go, the sun came out and I had to readjust all the exposures! It was a pretty manic time and I was remembering my words of advice to others which was in the event of technical issues, just leave the camera and watch the thing with your eyes. But as the final countdown began, I felt ready to go: both videos were rolling and the 7D’s remote cable release was in my hands, leaving me to watch the spectacle.